On the morning of August 24, Babson College’s peer mentors manned their stations. Donning Babson Beavers T-shirts, nametags, signs, and the smiles that are a signature of their position, their mission was clear: to welcome Babson’s newest class of students. Welcome them they did. 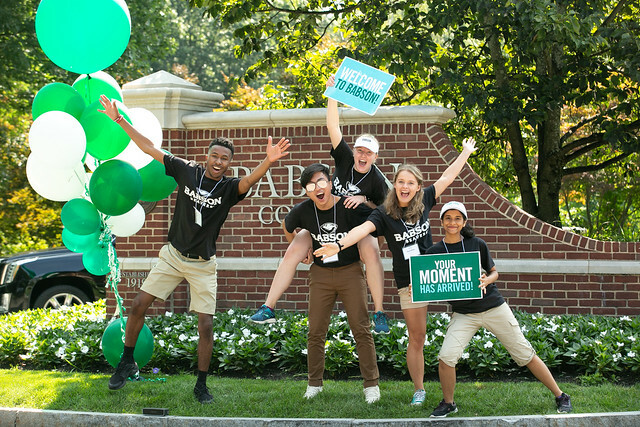 As Orientation began, 539 first-year students were welcomed to Babson College’s community in anticipation of the beginning of the 2018-2019 academic year. Students descended upon the Wellesley campus from 31 states and 40 countries. Among that group: 11 global scholars from 10 countries. Founded in 2014, Babson’s Global Scholars program awards need-based scholarships to a small, highly talented group of international students each year. This year’s group hails from Brazil, Bulgaria, Cambodia, China, Cote D’Ivoire, India, Pakistan, Paraguay, Slovakia, and Turkey. The global scholars are one of many cohorts of merit award recipients, students awarded four-year scholarships upon acceptance to the College. The Class of 2022 also includes 18 Center for Women’s Entrepreneurial Leadership scholars, 16 Presidential scholars, 13 Diversity Leadership scholars, 10 POSSE scholars, and four Weissman scholars, along with several Blank, Enrico, NFTE, Junior Achievement, and DECA scholars. Outside of merit scholarships, Babson met 100 percent of first-year students’ demonstrated need. Keeping with Babson’s emphasis on intentional diversity, affordability, and access, 20 percent of the members of the Class of 2022 are the first in their family to attend college. Nearly half—48 percent total—of the students are female, and 48 percent are domestic minority students (a 3 percent increase over last year). This group of first-year students is also the most selective class in Babson’s history; of the more than 6,000 applicants, just 24 percent were accepted. An additional 54 students will join the class in 2019 through the January GAP program, just in time for the celebration of Babson’s Centennial. Orientation programming aims to help incoming students adjust to the Babson lifestyle and transition into college by providing information and answers to academic, personal, and social questions. When classes began on August 29, the Class of 2022 got its first taste of Babson’s innovative curriculum designed for the changing business world. Among that innovative curricular experience: a 50/50 split between business and liberal arts courses, more than 25 concentrations to focus their studies, and Babson’s award-winning Foundations of Management and Entrepreneurship course where first-year students create, develop, launch, and manage a real venture.